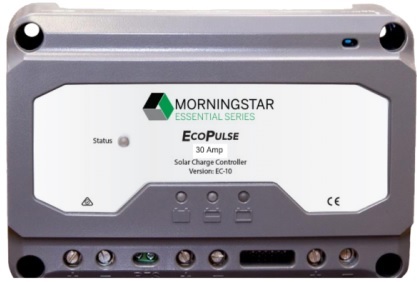 Pictured below is one of the new range of EcoPulse solar charge controllers from Morningstar Corp (makers of the ever popular SunGuard Solar Controller). EcoPulse controllers are a part of the new Essential Series™ of consumer rated products designed for residential and off-grid use including the leisure market. There are six different versions of the EcoPulse: 10A, 20A, and 30A rated with an interactive meter display as pictured above (EC-10M, EC-20M, and EC-30M), and 10A, 20A, and 30A rated with no display (EC-10, EC-20, and EC-30M) as pictured below. EcoPulse controllers are designed for 12V and 24V solar systems with DIP switches used to select either 12V, 24V, or auto-detection. These controllers are suitable for marine use as they are rated up to 100% humidity, the electronics have a protective conformal coating, and all connection terminals are corrosion resistant. The case is made from durable polycarbonate, and passive cooling is provided by an aluminium heatsink. 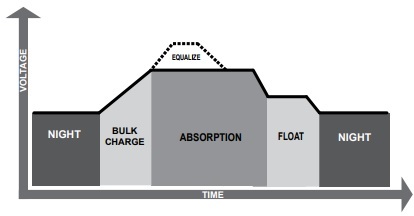 EcoPulse controllers have a 4-stage PWM battery charging algorithm – bulk charge, absorption, and float, with equalization available (automatic or disabled on non-metered models, manual or automatic on the metered models). The PWM frequency is 300Hz by default, but can be set to 1Hz if there is a problem with system noise. EcoPulse has a built in adjustable dusk ‘til dawn lighting controller with the solar array being used as the ambient light detector. (See our article Solar Panel as Darkness Detector for a simplified version of this technique.) A built in low voltage disconnect prevents the battery from being overly depleted by connected loads. 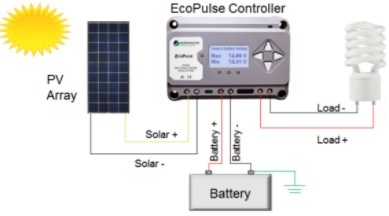 EcoPulse has a built in sensor for temperature compensation, but an optional remote temperature sensor is also available if the controller is to be positioned more than 3 metres from the battery bank. There is also protection against short circuit, over current, and high voltage etc with fault indications displayed with coloured LEDs. 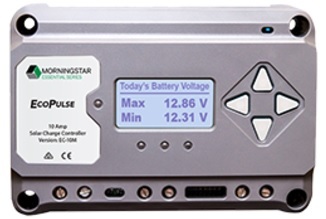 To find out more about EcoPulse, click here for the official Morningstar EcoPulse page where you will find links to the full operation manual and datasheet for the EcoPulse range.